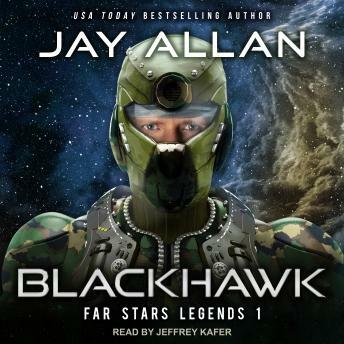 Blackhawk: a wanderer, a man running from a dark and sinister past. A genetically-engineered warrior, a capable and accomplished killer, he is also a lost soul, a man who has fled to the deepest reaches of space seeking his true identity. The Far Stars: the farthest extent of human habitation in the galaxy, a sector of a hundred inhabited worlds, it is a dangerous expanse full of pirates, mercenaries, and cutthroats. The sector is a rough and rugged frontier, lying beyond the darkness of the great Void, and the only place in all the vastness of space where men live free of the brutal empire that rules the rest of mankind. Celtiboria: once the premier world in the Far Stars, now a planet wracked by centuries of brutal civil war, driven to the edge of a dark age by the unending struggle among its Warlords for power and control. Augustin Lucerne: one of Celtiboria's feuding Warlords, a brilliant tactician and a respected commander. Lucerne is something rare on Celtiboria, in all of the Far Stars . . . an honorable man who fights not for personal aggrandizement but to save his world.